Looking for private in-home or in-studio Broadway Singing lessons? Our Littleton teachers are ready to get you started. Find your teacher today! I can help you learn how to project your voice and how to sing in a broadway style. I have been teaching the style of Broadway Singing for over three years now. My students who study this type of singing with me have gone on to land leading roles in many different musical productions around the city. Whether you want to prepare yourself for college auditions, sing better at your choir or church, or just enjoy the fun nd health benefits of singing, I can help you. With almost 15 years of teaching experience, I have come to watch many of my students go on to college and graduate school successfully. Most of them under full tuition scholarships. I am a classically trained singer myself and the approach to my lessons are over all focused on healthy emission of the voice with emphasis on breath suport and appropriate placement according to the style you want to perform: classical, musical theatre, jazz or any contemporary genre. I will help you reach your goals with vocal exercises and weekly routines designed specific for your needs. All you need is desire to learn and enjoy! I hold a Bachelor degree in Vocal Performance and a Masters in Vocal Performance and Voice Pedagogy. Singing and teaching are my two passions! I am a classically trained singer with an operatic lyric soprano voice. Opera is my first love, but I also like and enjoy singing musical theatre, jazz and other contemporary genres. In fact, for quite a while I taught at a Berklee International Network School in South America, where jazz was the main emphasis of my students. I enjoy teaching students from mostly any age and any background. From beginners to more advanced singers, as they all present some form of challenge and different rewarding experiences. l have successfully been accepted. Most of them under full tuition scholarships to pursue singing careers. Some of them are currently attending the University of Denver, CU Boulder, University of the Redlands, University of British Columbia, Universitat Mozarteum (Salzburg). I also have experience teaching senior citizens from a community choir and members from an all visually impaired choir. I have never encountered any difficulty while teaching students with special needs. This experiences have actually made me become a better more creative educator. My lessons are focused on healthy emission of the voice working on breath support and adequate placement of the voice according to the style. Once we have gone through a diagnostic and discuss the student´s goals, I prepare a routine of vocal exercises tailored for the individual needs and skill level of the student as well as negotiate on the repertoire that the student wants to sing. If teaching in the student´s home, I expect for the student to have at least a basic music keyboard for pitch matching purposes. I also expect my students to practice in between lessons so that every time we meet we can add another layer of knowledge. This will bring gratification and fulfillment to both of us! I had a great experience working with Daniela. Dani is a really special instructor for me! She helped me realize how big my passion for singing was because, since the beginning, she has inspired me with her singing, passion, and knowledge. She was my teacher for 4 years and she prepared me to get into CU Boulder’s School of Music. With her guidance I improved not only my vocal technique, but my musicality, acting skills, languages, and every single aspect that a singer needs to be a professional artist. She was really specific and patient about my growth as an opera singer and she always helped me find the perfect repertoire for me. I can say that I wouldn’t be where I am today if it wasn’t for her. Dani saw the best in me even when I didn’t, and I am still learning a lot from her. Daniela has been my favorite vocal trainer so far. Besides her expirience and knowledge about the voice, she took time to really listen to my voice and identify things I was doing wrong, or things I did not even know how to do. She empowered me so much that now I actually use my whole body to sing, and I also feel more confident to do challenging things, with my voice, with no harm. I feel that there is a before and after, in my voice, thanks to Daniela as my teacher. I performed top roles in ANYTHING GOES, HOW TO SUCCEED IN BUSINESS WITHOUT REALLY TRYING and CAMELOT using the traditional BROADWAY BELT method of singing and performance. I will teach my students how to brilliantly, but safely, belt out these thrilling Broadway roles. My youngest student now learning the BROADWAY BELT style is 9 years old! I have teaching students how to sing musical theater for 5 years. I teach how to add character to your singing and how to act out your songs fluently, how to enunciate, and of course how to sing correctly! BIO: Christine is a Lebanese-American soprano who has performed opera, musical theater and jazz concerts, and recitals in the United States and the Middle East. A graduate of Florida State University, Christine performed many roles by old and contemporary composers including Handel, Monteverdi, and Lori Laitman. Christine recently completed the role of Dalinda in Eklund Opera’s Spring production of Handel’s Ariodante, and will be returning to play the role of Maria in their Fall 2018 production of West Side Story. Christine holds a Bachelor of Music from Florida State University, and is currently completing a Master of Music at the University of Colorado, Boulder with a teaching assistantship in private and class voice. Christine is a Lebanese-American soprano who has performed opera, musical theater and jazz concerts, and recitals in the United States and the Middle East. A graduate of Florida State University, Christine performed many roles by old and contemporary composers including Handel, Monteverdi, and Lori Laitman. Christine recently completed the role of Dalinda in Eklund Opera’s Spring production of Handel’s Ariodante, and will be returning to play the role of Maria in their Fall 2018 production of West Side Story. Christine holds a Bachelor of Music from Florida State University, and is currently completing a Master of Music at the University of Colorado, Boulder with a teaching assistantship in private and class voice. ity. Every student brings a unique set of skills and needs to the table, and I believe the best method of teaching is a flexible one, that caters to the student's needs and goals. Teaching music is not only about notes and rhythms; it involved teaching the whole student. 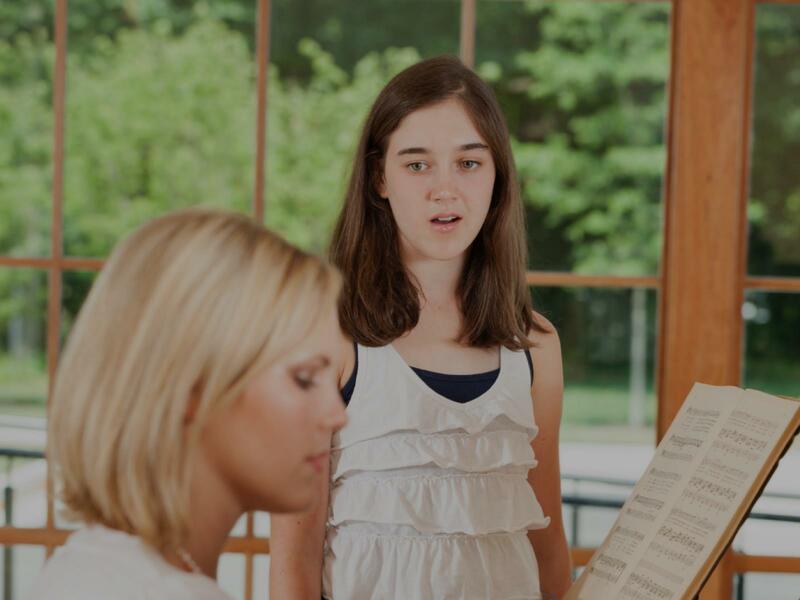 By taking voice lessons, the student will develop their singing skills as well as their listening skills, multi-tasking, working with others, and creative skills. Christine is a very knowledgeable and patient teacher. I’m confident she could handle any level of student. She is adaptive to many situations and will always have an answer to your question. 10/10 would recommend. It is such a joy working with Christine. I was extremely nervous to start voice lessons because the voice you're given is who you are, it is a very vulnerable art form. Christine made me feel very comfortable and helped me to sing the best with the voice that I was given. Her ability to diagnose and remedy problems in technique was stellar. I am much more confident in my abilities and willing to share my voice with other people. I know I wouldn't have been able to do that if it weren't for Christine. I would recommend her as a teacher one hundred times over!! Christine is a wonderful and talented teacher. She identified my individual issues and needs as a singer and offered many techniques to improve my breath support as well as relieve tension in my voice. She created an environment that was both productive and fun. I was impressed by her adaptability in catering to my specific needs as a singer and I grew a lot from my lessons with her. I highly recommend her to both newer and more experienced singers alike! eatre. i was thrilled by how hard we worked, what great shape she got my voice into, and how dedicated she was in helping me prepare, not only vocally but, with character work as well." "Alyssa really enjoyed her singing lesson with James and looks forward to her next lesson."